It’s been a week full of site audits and HTTPS conversions again, of course. But the frenzied pace has slowed down. I had a few holes in my schedule so I did some much needed updates to the BlogAid site. You’ll see a new message at the top of the home page. And I revamped the Resources page too. I’ve got more to add to it, but that’s a good start. And I got more testimonials from happy clients posted to the site too. You can see them on the HTTPS Conversion Service page and the Site Services page. I really love the style for those that Marcy Diaz of Amethyst Website Design made for me. That allowed me to drop the Thrive Ovation plugin I had been using for testimonials. It’s a super plugin, but I just like having it coded into the theme better because I can work with the code to call that style in just fine and I didn’t get along well with the Ovation interface. I think it’s a Mac thing, and I’m PC brained and an old coder. So, it’s more about preference in what you’re comfortable with than anything. Between now and spring I’ll be playing with new home page layout ideas and revamping some of the back pages for a better flow of my classes, services, and free resource material. I hope to segment things into 3 areas for those newer to site ownership, those who have been at this a while, and then webmasters and designers who build and maintain sites for others. So, look for more site updates. I also took an afternoon to build a new frame for my green screen. Figuring out how to do it was most of the fun for me. I decided to build it out of 1×2” wood instead of PVC because it’s actually lighter and sturdier. I’ll have the whole project posted on my carving site soon, as I’m expanding it to include DIY projects like this too. It’s a traffic thing, you know? It did me a lot of good to get out from behind the desk and get all hot and sweaty with a project out in the garage while manifesting something I dreamed up. Not taking breaks is an easy way to burn out. And with doing so much of the same thing for the last several weeks, I really needed that change of pace. What fun things do you look forward to doing away from working on your site? I’ve also got a reasonable enough schedule with client work now to get going on those tests I had to postpone when the HTTPS news hit. First up is the reply to comments notification plugins test. Share the comment reply plugin you use. I’ll be sure to include it in my tests. Leave a comment on the blog or anywhere you see this post online. And Webmasters, I’ll have the full case study details for you. This past week I heard from one of my clients that there is someone stealing Pinterest Pins by hotlinking to them on his site and offering them as free downloadable images. Well, that’s just wrong in so many ways. There’s a group of folks working to take him down. I suggest you check your Pinterest groups and buddies to find out more about that. But one of the suggested fixes is to hotlink protect your images. That may work, but you need to ensure you do it in a way that doesn’t cause you trouble. And some folks won’t be able to use it at all, like those who participate in link parties. So, go read my post with tutorials and screenshots on the 3 ways to implement it, plus the caveats of each. The latest WP release rolled out last week. It was full of security patches for XSS (Cross Site Scripting) code exploits. This is the most common type of vulnerability. Almost every plugin you use has been patched multiple times for it too. So, don’t be too alarmed by it. I noticed a slew of plugin updates right behind it, so be sure to check your site often right now as other updates continue to be released by devs busy fixing bugs and such too. In WP 4.8 we got a bunch of new widgets, including some dedicated to images, video, and audio. During site audits I’ve been seeing folks making use of the new image widget the most. Have you tried it? It’s pretty nifty. Sarah Gooding has a nice post on WPTavern about the next specialty widget that will be introduced in WP 4.9. It’s for galleries, which is way cool. I can immediately see this replacing resource hog widgets for bringing in your Pinterest or Instagram feed. In fact, I’m doing case study tests on those right now with a couple of site audit clients. You will be stunned to see how slow they make your site load time and the resources they chew up. Now, this new widget isn’t ready for prime time yet. But you can test it on a play site with the Core Media Widgets plugin. That’s the way WP devs test new features they hope to roll into the core now. They make a plugin for it so folks can independently play with it and work out the bugs. Here’s the official post on it from the WP devs. I’m definitely going to get this on my testing list pronto, because I can already see the majority of my clients making use of it immediately when it becomes available. Webmasters and designers – you’re going to want to check this new gallery widget out pronto, as they plan to add a way for theme styles to be applied to it. I can see clients asking you to add those to their themes. So, lots of quick jobs in store for you. But, it looks like that is too little, too late for WordPress devs. There’s been a whale of WP drama around this whole thing, and devs squabbling about which other JS framework would be more suitable. With this latest announcement, they are still squabbling that it will be tougher for plugin devs to learn the new core coding and standardize their plugins to it. In fact, there will be nowhere to learn it except WordPress, and they’ll be making it up as the go. Bulk, slow load times, and potential conflicts, at least in the short term. Folks, we’re looking at this hitting in January. That’s right around the corner. Just like the previous post I mentioned, Team Yoast is very concerned about a framework-agnostic approach leading to a bloated mess that makes debugging WordPress and plugins too hard and slows down page load times. Some of you may not know this, but Joost de Valk and his team are very involved with contributing to the WordPress core. They, along with every other plugin developer, have a big stake in the next choices WP makes about how they want to go forward. And that means that all of us, who use the things all of these developers make, also have a big stake in this. I’m delighted to see Team Yoast express their concerns because it carries weight in the community. I’m also delighted to see the last statements on that post urging all developers to fully support whatever decision is made and to get on board so we can keep moving forward. 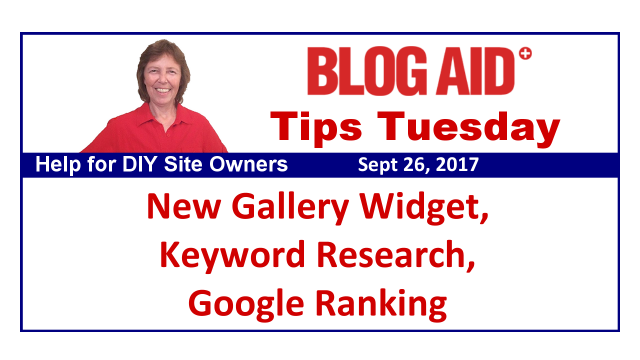 I often get asked about better keyword research tools. That’s so 2015 and not the burning question to be asking these days about how to improve the SEO on your site. This super post on Search Engine Journal will help you update your mindset about keywords. Google now has AI (Artificial Intelligence) and it thinks about keywords more like humans do, and based on the intent of the query, not just the words. Once you get your mind wrapped around answering questions, and stop focusing on specific terms, you’ll do way, way better with your SEO. Having one of my posts make it into Google’s Knowledge Graph has continued to bring my site massive traffic for the past 3 years. I have substantial authority on the topic, which is the main reason it’s in that lofty search position. But the other reason I think it is highlighted is because of the formatting I used in the post. That’s something I believe I’ll include in the next SEO Workshop coming in early 2018. I’m thinking around February. I had to read the video transcript 3 times to scrutinize what he was saying. It’s all about the site stuff that does not directly impact your Google ranking. Several of the items he pointed out as stuff to not worry about are going to hurt you. It may not hurt your ranking, but it’s going to hurt in other ways, like conversion. So, take this one with a grain of salt and be sure you know what’s important to your site and your readers, not just to your ranking, before you blow these things off. It’s hard enough to get good organic reach on Facebook these days. But now it’s going to be even harder if you have a super slow site. Facebook has changed its algorithm to detect how fast sites load from the links shared on Facebook. If it’s super slow, Facebook has decided to just not show it to many folks. The reason why is because they know 40% of folks simply abandon a site if they don’t start seeing something of interest in 3 seconds or less. And that ain’t ads, it’s content. WebPage Test is my site audit work horse for gauging performance and all of the things that are slowing down a site. Two new data items have been added that I’ll be digging into over the next month. You’ll find one on the Summary page. It’s another table of data and I have no idea what all the different columns are trying to tell WPT, but he’s slipping in more and more checks based on Google ranking factors. The second new thing is an image optimization checker. It gives you a lot of data about the images, but I’m not sure that any of it is all that actionable. It basically tells you how much file size you could save by changing from .png to .jpg, which isn’t appropriate for all images. I’ll dig more into that one too, but I’ll likely be calling on my webmasters/designers who create graphics and images to help find all the goodies in this new info. I use Comment Reply Plugin A WordPress plugin enabling email subscriptions for comments. Version 161213 | By WebSharks, Inc. I can always count on it but there are a few things I am concerned about. It creates a lot of tables and files regarding subscription and reply emails. These can’t be cleared at will and get very large. I delete them regularly but am not sure if they are still being held in a folder. I would also like to be able to easily add some CSS to the emails themselves. I won’t pay for the premium version as I just am looking for a simple plugin to email my replies to commenters and give the option to the commenter to receive them or not. Thanks Marilyn. I’ve added that one to my list and noted your concerns about it. Appreciate knowing what you’d like checked. I use Lightweight Subscribe To Comments by Isabel Castillo. I have had no issues and I like that it sends a thank you to first-time commenters. Thank you so much, Gaye. I have it added to my testing list. I’ve been using the “Comment Reply Notification” plugin for about 4 years. Thanks Diane. That seems to be one of the most popular ones. Got it on my list!